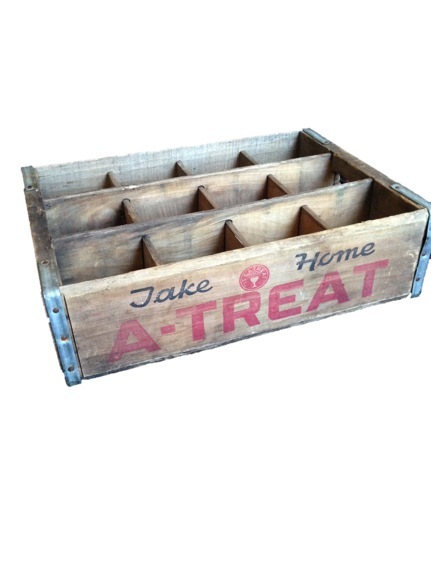 A-Treat beverages were first produced in 1918. And pretty much were produced the same way ever since. A-Treat brand soft drinks have gained a reputation for superior quality and flavor. And from someone who drank them her whole life, boy were they good. They produced their flavors from basic essential oils or procured flavoring material from outside sources produced according to their specifications, instead of ordering them from a flavoring house. A-Treat produced soft drinks in at least 16 different flavors, including Big Blue (blue raspberry), Birch Beer, Black Cherry, Champagne Kola, Cola, Cream soda, Fruit Punch, two kinds of Ginger Ale (Pale Dry and Golden, formerly Peppery Golden), Grape, Grapefruit, White Birch Beer, Pineapple, Sarsaparilla, two kinds of Orange (regular and Orange Dry), Lime (formerly Tom Collins Mixer), Tonic Water (formerly Quinine Water), Strawberry, Treat-up, and Root Beer. Cream and Sarsaparilla were my favorite.